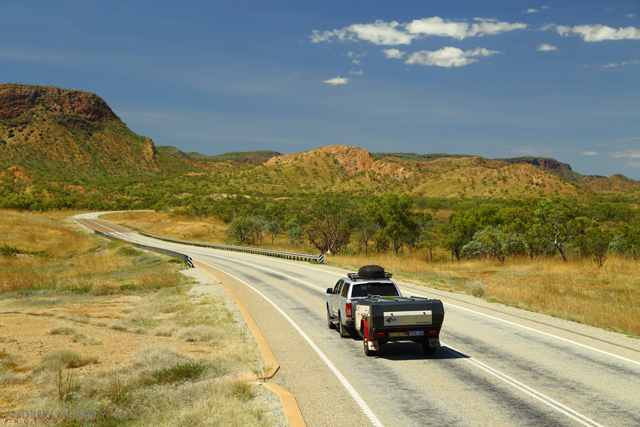 Posting #10 of my road trip from Fremantle to Kununurra, Western Australia. 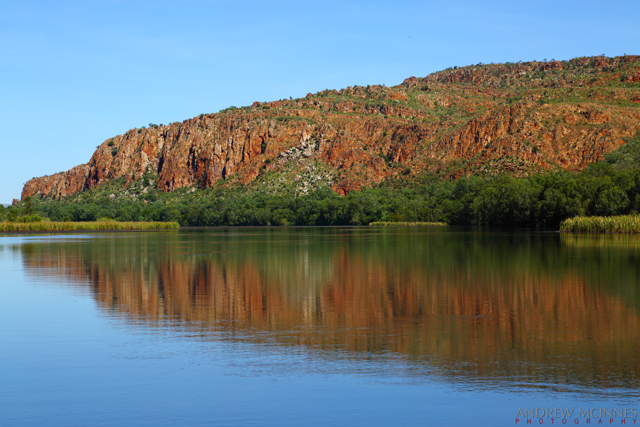 A collection of images from Lake Kununurra, Lily Creek Lagoon, Ivanhoe Crossing, and the iconic Cockburn Ranges – all proximal to Kununurra, Western Australia. 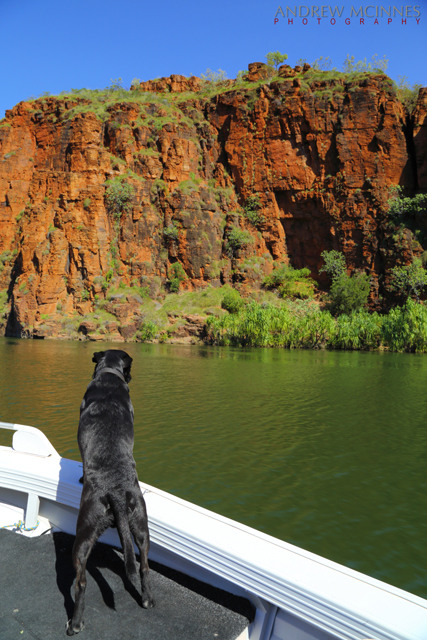 A delightful boat ride up Lake Kununurra – the dog enjoyed the trip, especially the breeze in its face. Lake Kununurra 2AM-003377. © 2014 Andrew McInnes. Lake Kununurra 2AM-003403. © 2014 Andrew McInnes. Lake Kununurra 2AM-003421. © 2014 Andrew McInnes. Lake Kununurra 2AM-003422. © 2014 Andrew McInnes. A couple of the numerous and delightful inlets along the way. Lake Kununurra 2AM-003425. © 2014 Andrew McInnes. Lake Kununurra 2AM-003435. © 2014 Andrew McInnes. The exposed geology is fascinating and stunning. Lake Kununurra 2AM-003437. © 2014 Andrew McInnes. 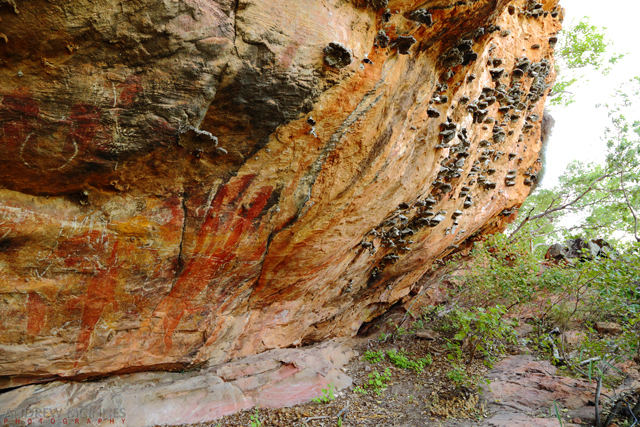 The Kimberley region has numerous sites with indigenous rock art; this particular location is very near to Kununurra. 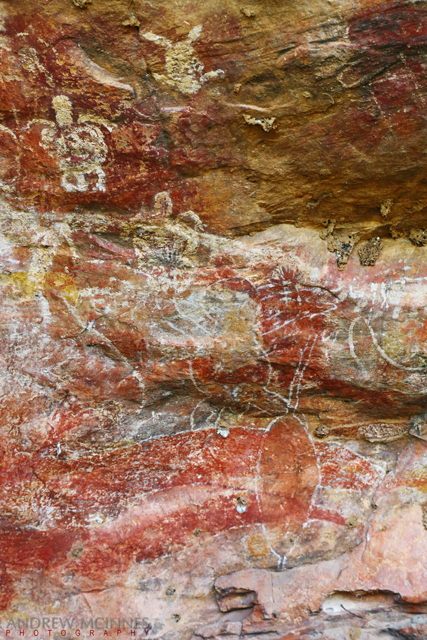 Aboriginal Rock Art 2AM-003475. © 2014 Andrew McInnes. Aboriginal Rock Art 2AM-003480. © 2014 Andrew McInnes. 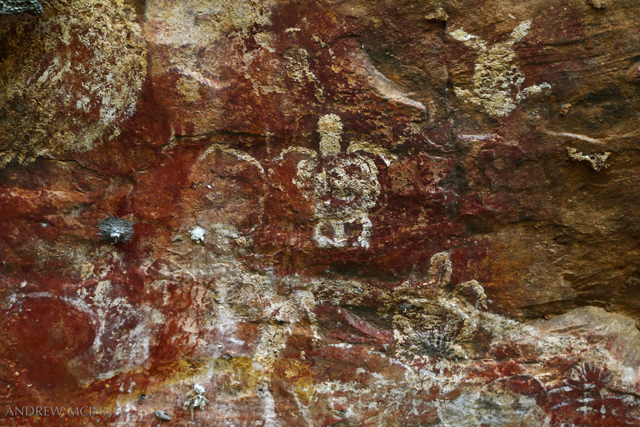 Aboriginal Rock Art 2AM-003483. © 2014 Andrew McInnes. 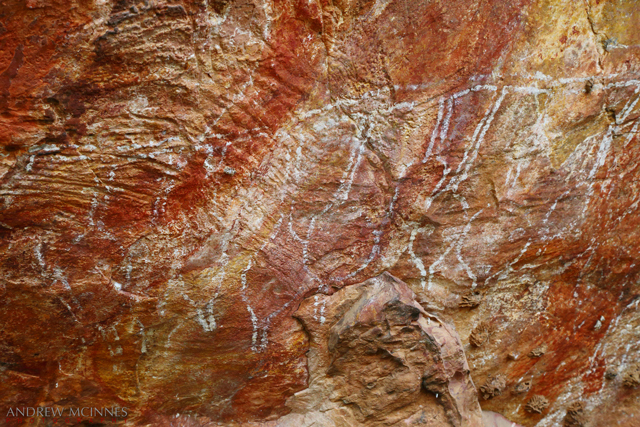 Aboriginal Rock Art 2AM-003485. © 2014 Andrew McInnes. 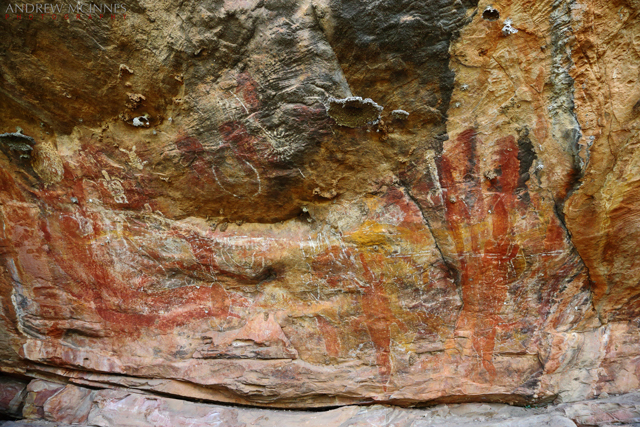 Aboriginal Rock Art 2AM-003487. © 2014 Andrew McInnes. 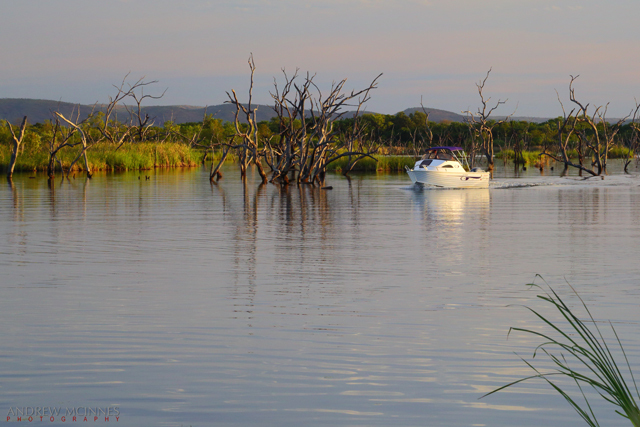 The view from the boat ramp on Lily Creek where we began and concluded this trip up Lake Kununurra. Lily Creek Lagoon 2AM-003504. © 2014 Andrew McInnes. Lily Creek Lagoon with ‘Sleeping Buddha’ in the background. Lily Creek Lagoon 2AM-003502. © 2014 Andrew McInnes. Highway Outcrop 2AM-003088. © 2014 Andrew McInnes. Highway Outcrop 2AM-003079-003082 panorama © 2014 Andrew McInnes. 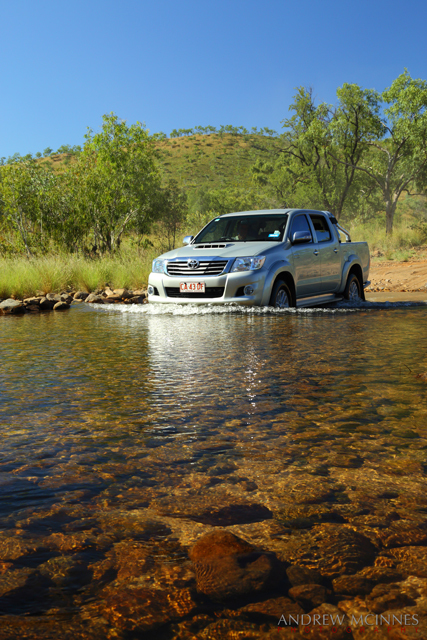 A couple of images of vehicles crossing a small creek on El Questro where we stopped off for a refreshing dip (swim). El Questro 2AM-003308. © 2014 Andrew McInnes. El Questro 2AM-003319. © 2014 Andrew McInnes. Not far past El Questro, on the famed Gibb River Road, is the Cockburn Range which is adjacent to the iconic Pentecost River but the river was flowing too much for us to make a crossing. There was an unfortunate couple stranded during their attempt at crossing – their front axle fell into a deeply eroded hole resulting in a cracked oil-pan or something similar, necessitating a tow out of these croc-infested waters. Cockburn Ranges 2AM-003366-003368 panorama. © 2014 Andrew McInnes. 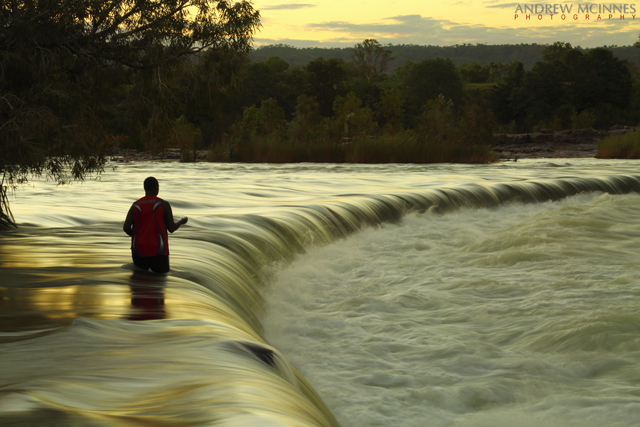 Having captured this late-afternoon image of a man fishing for barramundi with a live bait on a hand line at the fast-flowing Ivanhoe Crossing, Kununurra, I moved on to shoot other nearby compositions. 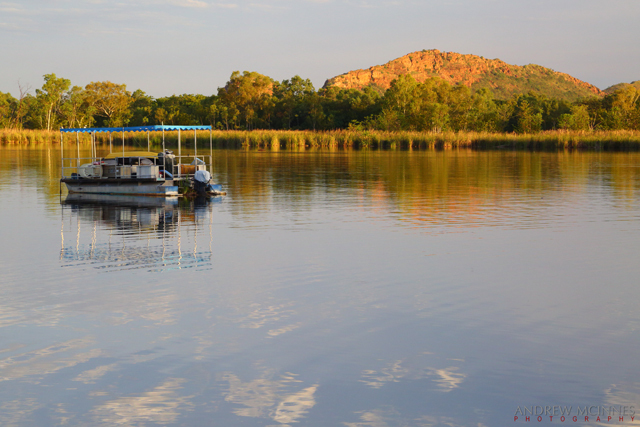 This area is accessible for the numerous salties of the Ord River and is also thick with barramundi. Soon after I moved I saw this fisherman in a mighty tug-of-war battle that, with the aid of the deep and rapidly flowing water, soon had him precariously close to taking an involuntary bath! Ultimately he was saved the ignominy as his large gauge hook was straightened, thus losing whatever was on the end of the line! The Ivanhoe Crossing is no longer open to vehicles. Ivanhoe Crossing 2AM-003178. © 2014 Andrew McInnes. The next blog posting will contain images from Marlgu Billabong and Wyndham. 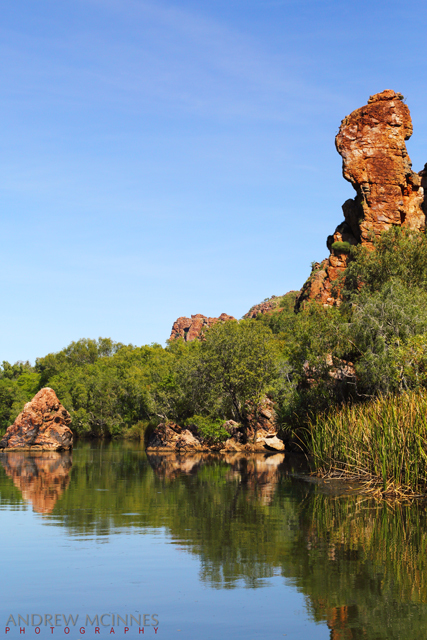 Posting #7 of my road trip from Fremantle to Kununurra, Western Australia. 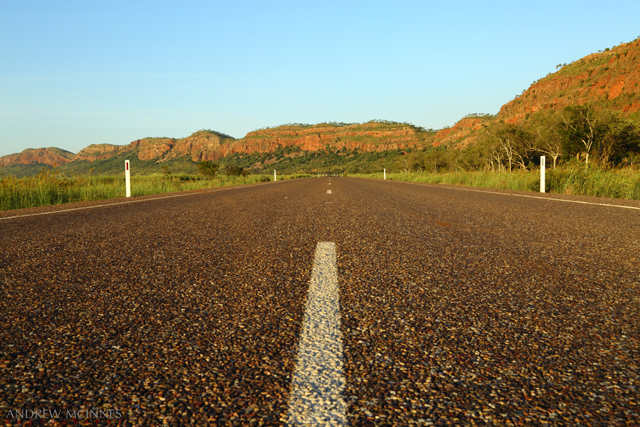 Ah, I arrived at my destination – Kununurra – after 9 days of driving and bush camping. 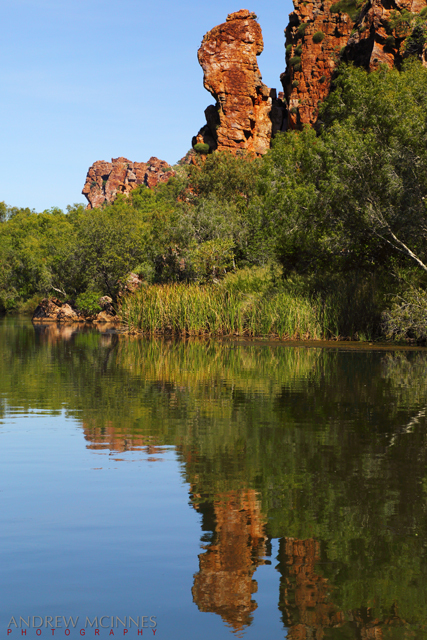 Here are some images around the greater Kununurra area from the first day or so. Not far short of Kununurra, and the scenery, topography, and geology changes (after leaving Halls Creek). Great Northern Highway 2AM-003678. © 2014 Andrew McInnes. 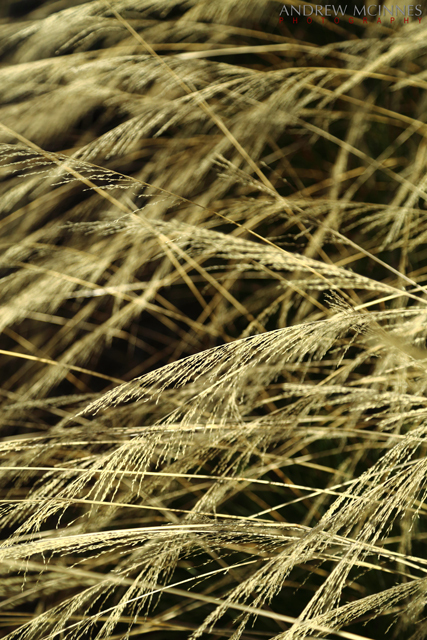 Grass 2AM-002958. © 2014 Andrew McInnes. Grass 2AM-002960. © 2014 Andrew McInnes. 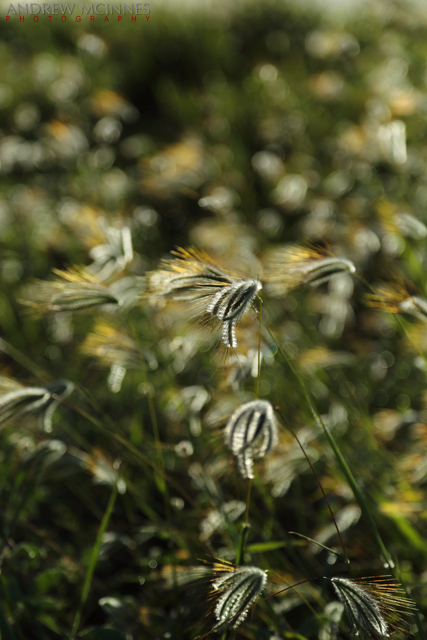 Grass 2AM-003141. © 2014 Andrew McInnes. 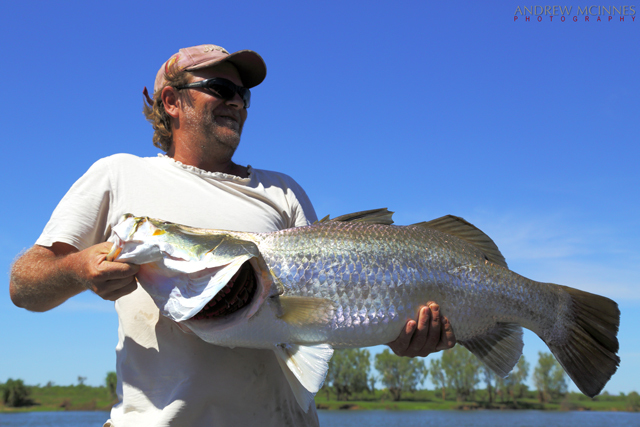 The fishing is fantastic in the Kimberley; this is a 1.14 meter Barramundi (released immediately after photo) caught on the lower Ord River. Fisherman and Barramundi 2AM-3066. © 2014 Andrew McInnes. 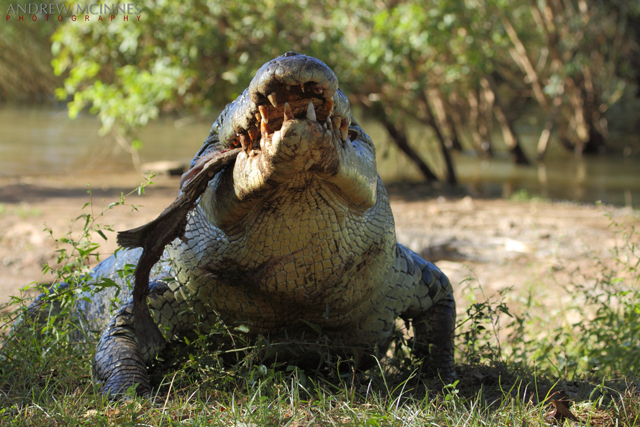 The ubiquitous estaurine crocodiles (“Saltwater Crocodile”) necessitate care around the water. 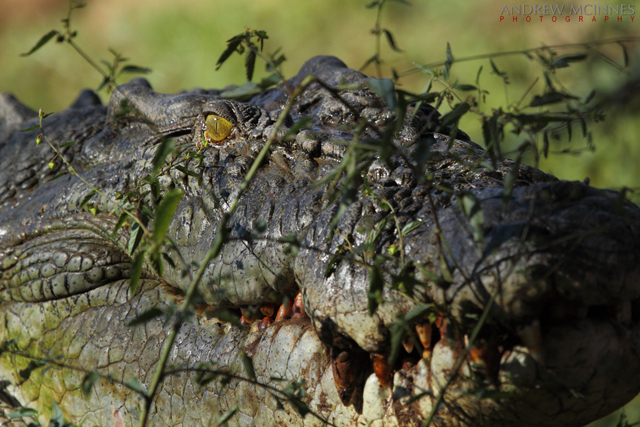 Saltwater Crocodile 2AM-004748. © 2014 Andrew McInnes. 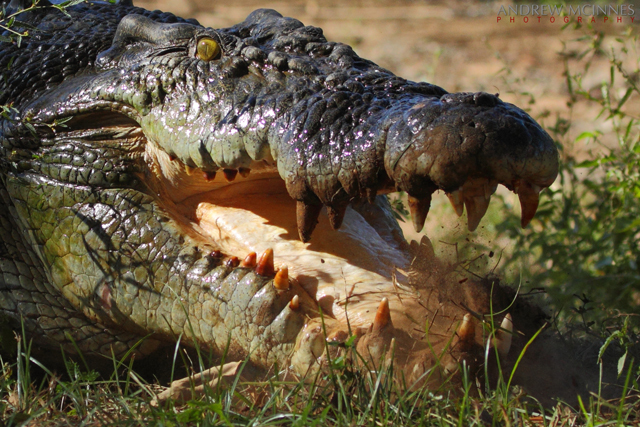 Saltwater Crocodile 2AM-004757. © 2014 Andrew McInnes. Saltwater Crocodile 2AM-004771. © 2014 Andrew McInnes. 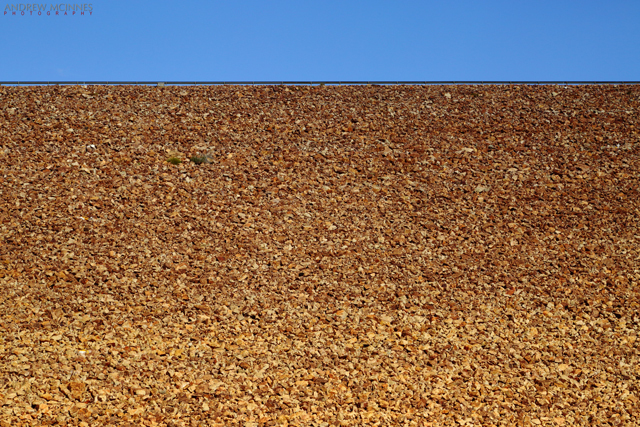 If you have watched the movie “Australia” then you may recognise this geologic feature, known as ‘House Roof Hill’ – it is the backdrop to the fictional “Faraway Downs” homestead. 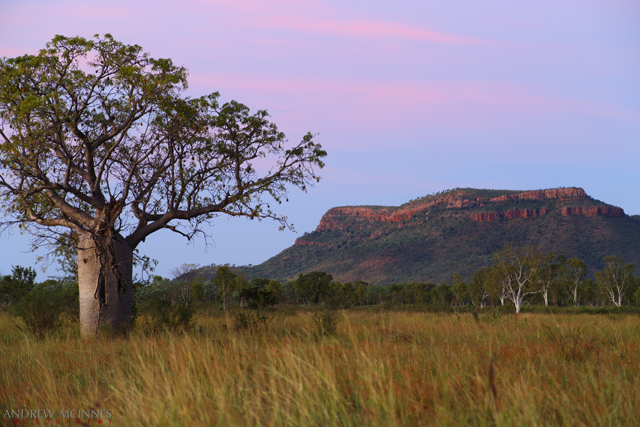 This image was captured very early on another glorious Kimberley morning. House Roof Hill 2AM-003047. © 2014 Andrew McInnes. 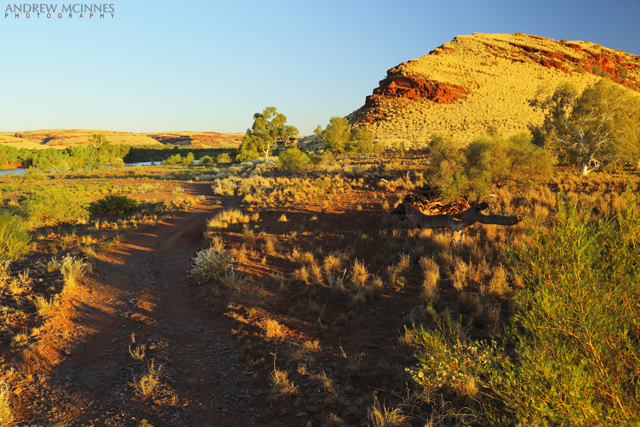 The next image is “False House Roof Hill” – neighboring bluffs along the Ord River. False House Roof Hill 2AM-003013. © 2014 Andrew McInnes. The April 2014 Lunar Eclipse occurred whilst I was in this area. 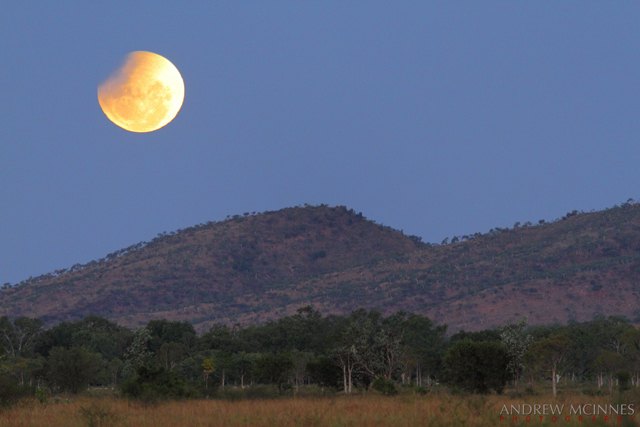 The following image captures part of this eclipse over a Kimberley range. Lunar Eclipse 2AM-004793. © 2014 Andrew McInnes. 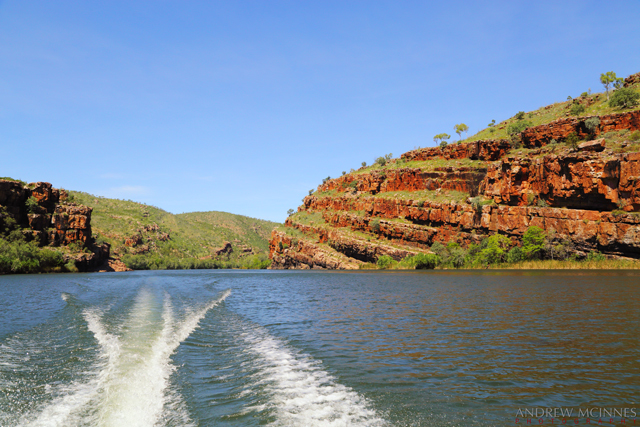 Lake Argyle is Australia’s largest artificial lake (by volume). It is part of the Ord River Irrigation Scheme and is a sight to behold. Unfortunately these “roadside” images are all I managed to capture of this vast and beautiful feature – I must return and spend time above and on the lake! Lake Argyle 2AM_3131-3134 panoramic. © 2014 Andrew McInnes. An alternate view of the Ord River Dam – construction was completed in 1971. Lake Argyle 2AM-003126. © 2014 Andrew McInnes. 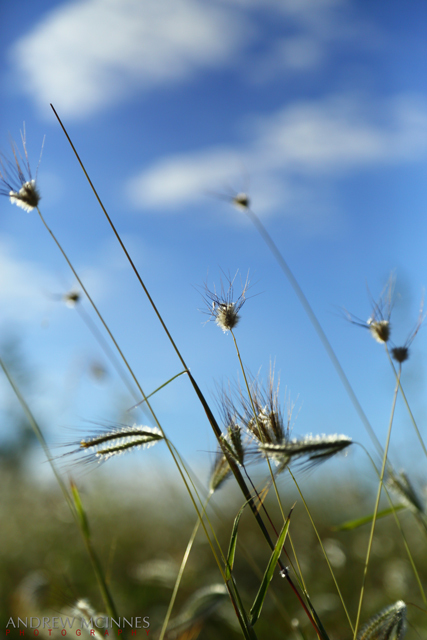 Grass in seed along the dam wall – beautiful April conditions. Lake Argyle 2AM-003137. © 2014 Andrew McInnes. Posting #4 of my road trip from Fremantle to Kununurra, Western Australia. During my recent >9,000 km road trip highway vistas like this one routinely had me in awe of the scenic beauty of this wonderful land. 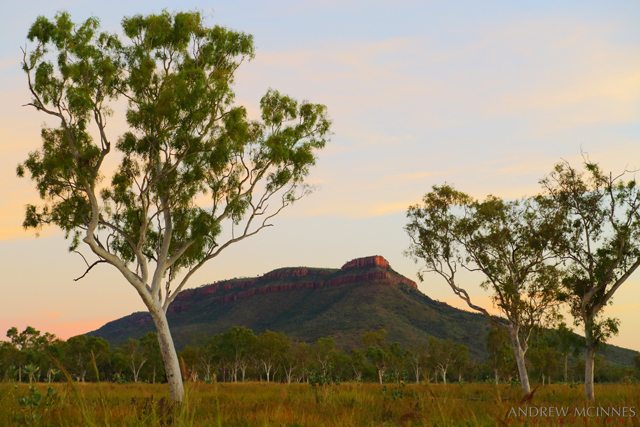 A three-image panorama stitch on the North West Coastal Highway © 2014 Andrew McInnes. 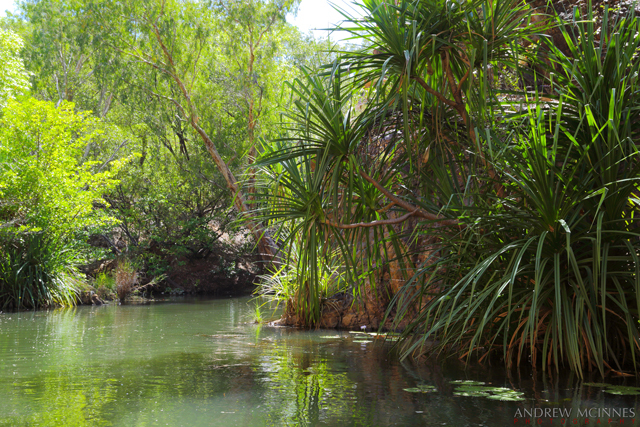 Oh, how I enjoy the tranquillity of a sleepy river and the Australian bush. This is the De Grey River and rail bridge just off the Great Northern Highway near Port Headland, Western Australia. I didn’t camp here but I did enjoy the respite as I stretched my legs during the long drive. 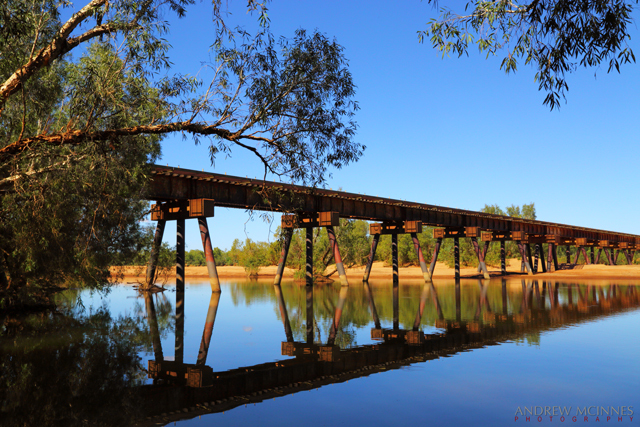 De Grey River and railway bridge – a wonderful camping area. © 2014 Andrew McInnes. 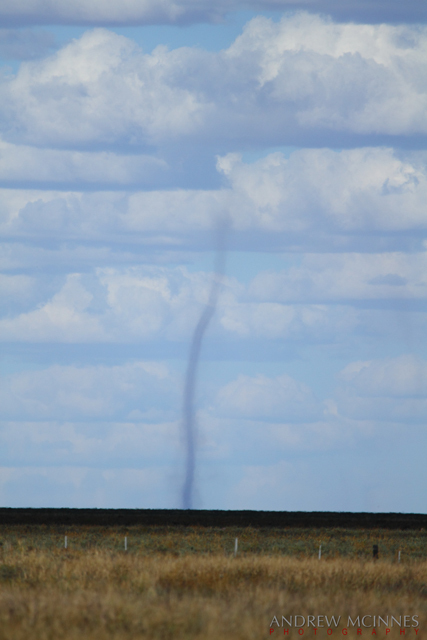 Willy Willy (dust devil) – very neat to observe © 2014 Andrew McInnes. 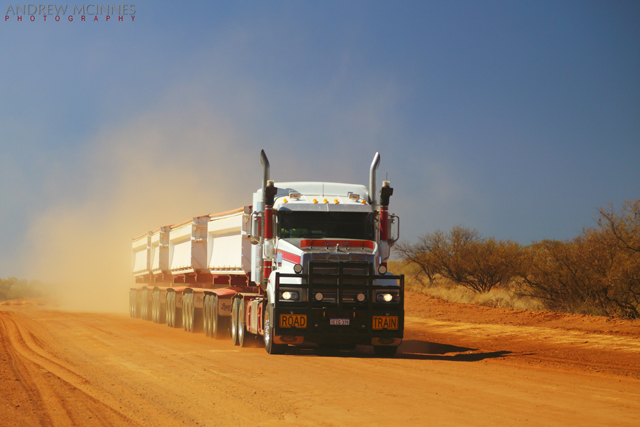 The ubiquitous road train: some transport livestock, some transport supplies, and for others, like this one, it is iron ore.
Road train near Onslow. © 2014 Andrew McInnes. 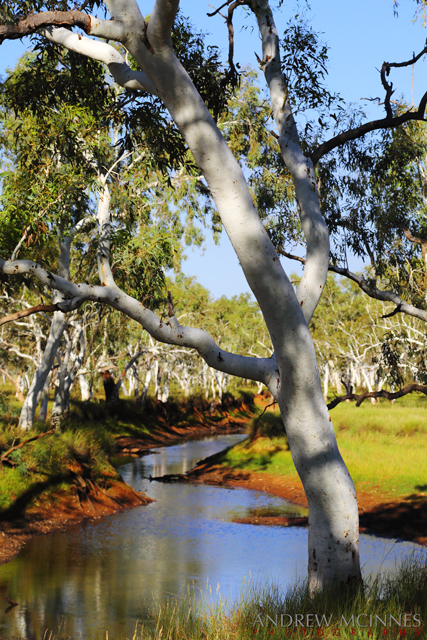 Fortescue River. © 2014 Andrew McInnes. 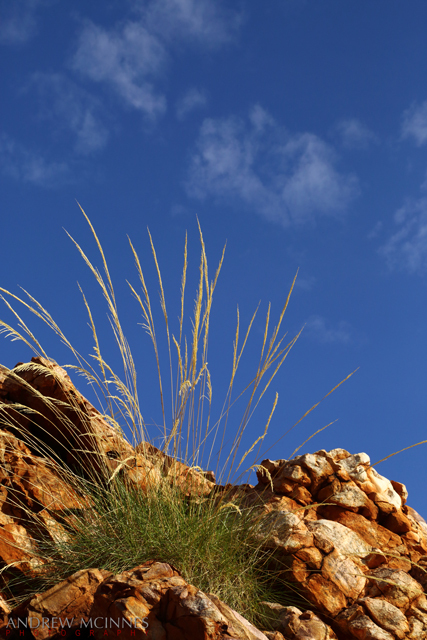 Common colours of the Pilbara – red, green, gold. 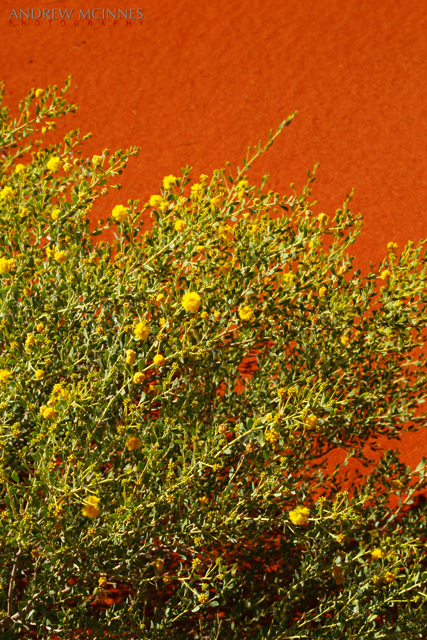 Autumn flowers on a red dune. © 2014 Andrew McInnes. 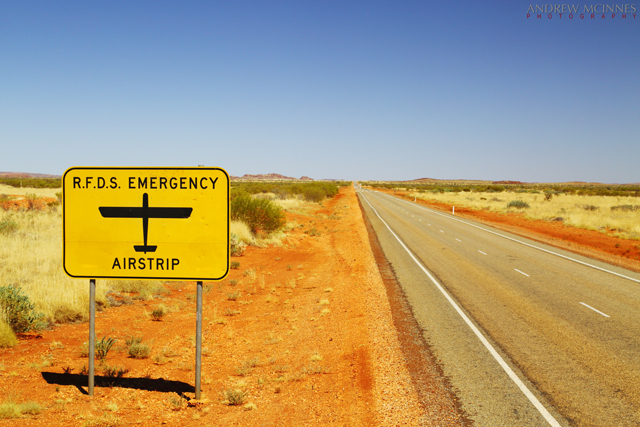 Royal Flying Doctor Service – emergency airstrip. © 2014 Andrew McInnes. 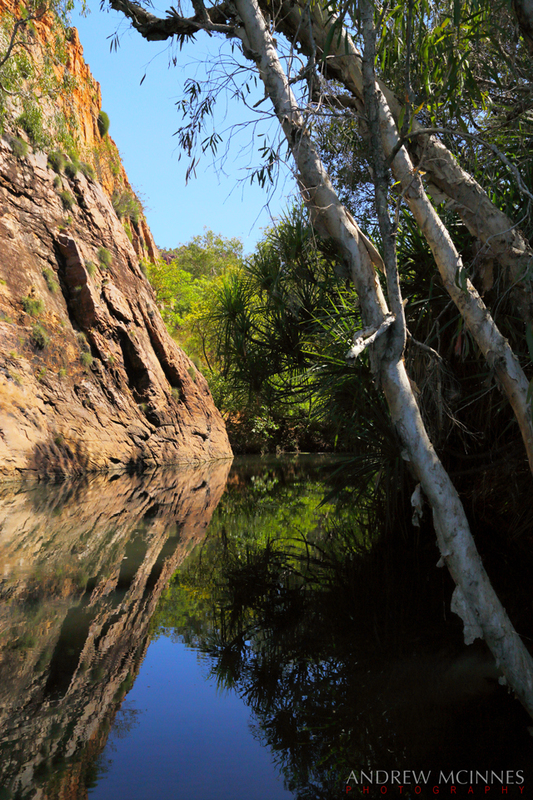 Toolunga Creek in the Pilbara. © 2014 Andrew McInnes. Thanks for swinging by and I hope you enjoyed these photo’s of my travels.